Hope to write more about this soon, but for now, let us just say it is superb.Here is what I wrote on my blog:Testimonies are powerful. The apostle Paul gives his testimony in the book of Acts more than once, and he did so to great effect. The center of New Testament-style evangelism is found in the two-fold ministry of preaching and testimony. How will they hear without a preacher (Rom. 10:14)? And the one who believes has the witness (marturia) in himself (1 John 5:10).Witnesses in the first century gave testimony to what the incarnate Christ said and did (1 John 1:2). But that does not render witness superfluous in the ages after—because the Holy Spirit was given to take the place of Christ, and He has been active down to the present day. This is why testimonies have the capacity to be singularly powerful. They can be done poorly, and can be over-run by hackneyed clichés. But sermons can be done poorly also, and yet no one doubts that preaching is an instrument appointed by God.This testimony is delivered with exceptional grace and force. The Great Good Thing is the testimony of how Andrew Klavan, a secular and very messed up Jew, was found by Christ.Klavan is an award-winning writer, and it shows. He brings exceptional talents to the description of an exceptional story, one I thoroughly enjoyed reading. The genre of his other books is “crime novel,” a part of Lit Town where I do not usually go, and so until this book I was unfamiliar with his writing. But in the world of mystery and crime writing, he is a well-known name. His novel True Crime was made into a movie, as was Don’t Say a Word. He has won the Edgar Award twice, and can safely be called a competent wordsmith.I was familiar with him because of his online video commentary on politics and culture, which are very funny and almost always leave bruises. I found out about this book because of his political presence online, ordered it willingly, and read it even more willingly. This is a testimony that has the power to put both hands on your shoulders, and make you sit down with the book.Here is his description of how he began praying, before He even knew who he was praying to.“After a while, though, it began to seem to me that I was thinking too much about perfect truth-telling. It was a waste of prayer time. The human heart is so steeped in self-deception that it can easily outrun its own lies. It can use even meticulous honesty as a form of dishonesty, a way of saying to God, ‘Look how honest I am.’ So I let it go. I let it all go. I just flung wide the gates to the sorry junkyard of my soul and let God have a good look at the whole rubble-strewn wreck of it. Then I went ahead and told him my thoughts as plainly as I knew how” (p. 239).His was a conversion that had cultural, historical, intellectual, and emotion reasons. He deals with them all, honestly, seriously, and without any sanctimony. You will never read a less sanctimonious testimony.We live in a time when stories like this need to be told, over and again. I cannot recommend this book highly enough. Of a sane man there is only one safe definition. He is the man who can have tragedy in his heart and comedy in his head. --G.K. ChestertonI do not usually read books of this kind, because stories of Christian conversion, though important and necessary, are also so highly personal they are almost unrelatable, even to someone who has experienced her own journey with the same conclusion. No one is born a Christian. When St. John supposed that if all the things that Jesus did were written down "the world itself could not contain the books that would be written," I cannot help but wonder if he could be hinting at the millions of stories in the lives of millions of Christians over thousands of years. Each one is a new story. God does not have grandchildren. But, I love Andrew Klavan, and so I had to read this book. In fact, to me Klavan is like a modern-day G.K. Chesterton, in that he can write and speak meaningfully and entertainingly on such a wide variety of topics that one never tires of hearing him. His light touch and comic outlook make the profundity of his thinking a gasp of surprise to the uninitiated; but, it is a highly addictive combination. He brings both the comedy in his mind and the tragedy in his heart to this story of his conversion.In a way, this is ultimately the story of two trinities. The Holy Trinity, of course. But, the son, the father, and the spirit of the secular realm are Klavan and his own father (a secular Jew himself, who clung to the barest religious rites out of cultural ferocity and guilt: "It was not in his nature to openly defy a Gigantic Invisible Jew who could give you cancer just by thinking about it.") and the spirit of Klavan's wife Ellen, who never quite takes on flesh and dwells with us but floats like a benevolent presence in the background. What is amazing in a way is that, for a crafter of characters that novelist Klavan has become by trade, there are very few characters in this story. It is mostly just one man at the Jabbok, wrestling demons and God and his own nature. Yet, that one character--Andrew Klavan--is so compelling that the story will not let you go until you bless it. And I do bless it. I do.In the Introduction to his own spiritual memoir of sorts, Orthodoxy, G.K. Chesterton writes a sentence (the whole preceding paragraph, really) that kept coming to my mind as I read The Great Good Thing: I did try to found a heresy of my own; and when I had put the last touches to it, I discovered that it was orthodoxy. It takes a special sort of spiritual persistence to arrive at those words. I think Klavan matches Chesterton for relentless pursuit of a cogent, integral philosophy.Andrew Klavan, raised and marinated in the fallacies of his time, sorted through them all, went to the brink of sanity (and even a tad beyond), fought and cursed and feigned indifference to the Maker of his soul, and discovered orthodoxy. Wow.Klavan makes as good a case as any I've heard against the gods of Materialism, nihilism, etc. This is a book he had to write, a book that Christendom needed him to write, and a book that any God-wrestler--and that is every single one of us, whether we admit it or not--will benefit from reading. Christmas. Father hunger. Good literature. Commitment to coherent story. Recognition of what underpins Western culture. The beauty of nature. The love of a good woman. The birth of a child. A breaking mind. The effective kindness of a therapist (in spite of a godless worldview). Baptism. These are some of the patient graces by which God brings Andrew Klavan to Himself. Klavan came to Christianity through unexpected paths, and he didn't land in my neighborhood (Reformed and Evangelical), but I cannot doubt that his faith is genuine. I found some things troublesome in his thinking (he's wobbly on the nature of Scripture, for instance), but he's significantly ahead of me in some areas (a much better pray-er, for instance). It all reminds me that each of our stories is much less about ourselves than about the God who is writing them. They're all His story. To fuss at Klavan over the differences in our stories would be to fuss at our Author over the color of ink He's using.As for the earthly author, the man can write. I think this is the best-written memoir I've ever read. If I'd consumed it on paper, I'd've underlined a good bit and would share some quotes with you. He's also a good reader, and appears to have narrated all the audio versions of his books. I feel as if I should read at least one of his novels, but the thriller genre is not my cup of tea, so I'm not sure I'll ever get around to it. I listened to this as read by the author. It was inspiring, as all conversion stories are, and worth reading for that aspect alone. However, this book was so much more. In the story of Andrew Klavan's dysfunctional family, the way literature and Western civilization led him to self discovery, and his descent into and ascent from madness, we are given the story of a truth seeker in an age of disbelief.I found Klavan's story resonating in unexpected ways. Every conversion story is at once the same, in its discovery of ultimate truth and love, and at once unique, as is each person who discovers God. I knew I would find things that reminded me of my own journey and that showed me new facets of God's love in Klavan's experiences. What I did not know was how familiar his life story was to certain aspects of my own and how that actually helped me to understand myself better. My own difficult father was much less so than Klavan's, for example, but they were enough alike that Klavan's insights about his own personality enlightened me as well.I will also say that his experience with prayer has haunted me, in a good way, and rejuvenated my search for closeness to God.Much of the story was outside my own experience, of course, and I have to say that I really appreciated Klavan's feelings about his Jewish heritage which gave me insights that I'd not gotten from other sources.Klavan is hard headed, questions himself and his experiences, and does not go easily into Christian faith or, indeed, into faith in God in general. I really liked that aspect because many of the objections he struggles with are precisely those which we have all been taught to raise these days. Whether one believes in Christ or not, no one can say that Klavan accepted him blindly. In fact, no one need worry that Klavan is trying to convince anyone else to believe. This story is strictly about his own experience. Highly recommended. This conversion memoir is in itself a magnificent book. I expected Klavan to be an excellent writer, but this is simply beautiful. The story itself is powerful and in many respects unexpected - the story of a Jewish-American growing up in the fervid '60s, hoaxing his way through college, slowly going mad, slowly coming sane again - and discovering God in the unlikeliest of places: not so much in the pain of existence as in the joy; not so much in sermons as in stories from Raymond Chandler to Thomas Malory.As a writer myself, some of the author's experiences seemed incredibly familiar to me, but from reading the other reviews, I think this must be one of those books that resounds with everyone for different reasons. Recommended. Although Andrew Klavan is a prolific writer of adventure novels, I was familiar with his name only via a few journalistic articles he had written--- adventure genre not being my thing. It was the subtitle of this memoir that grabbed my interest: "a secular Jew comes to faith in Christ. "A brilliant man, Klavan's inner life was set up for turmoil by his upbringing. His parents were atheists, but clung to the external rituals of Judaism. His Bar Mitzvah did violence to his soul because he was forced to make a public display that held absolutely no meaning for him. The guests who attended his Bar Mitzvah showered him with rich gifts, which he carefully hoarded in a little box. From time to time he'd take the box out and look at the contents, but they sickened him. It was blood money to him; Klavan felt like he had been bribed to perform an action that was repugnant to his soul. One night, he crept outside to the dumpster and threw the box in, taking care to hide it well so it would never be unearthed. That action lifted a weight off his shoulders and is an example of his absolute, unwavering honesty. Klavan had an uphill climb to faith, something he didn't overtly even seek. What he did seek was WORDS. He loved words, loved writing, loved reading, loved Western culture. He began to see that Western culture could not be divorced from Christianity, so he began to read the Bible and explore from a purely historical and literary point of view. There was a great deal of turmoil and inner conflict as he delved into these studies. On the one hand, all the beauty of Shakespeare and the rich repertoire of the west had its roots in Christianity. But there was a dark blot: a cruel anti-Semitic streak in church history that popped up again and again. How could a system that produced such beauty be so flawed? If Klavan could not be forced to be a Jew by external ritual, neither could he deny his heritage. He was Jewish, whether practicing or no.Through many mental tortures, Klavan's intellectual honesty ultimately brought him to faith in Jesus. His arrival at that juncture created a whole new set of challenges as he had determine how to "come out" to his family and to make a public acknowledgement of his newfound faith.Let me just say that this man is not only brilliant, but brutally honest in his dealings with himself and others--- never resting until his inner life and outward persona display perfect congruence. His baptism and embracing of faith was the climax made even sweeter by the torturous twists and turns of his journey. The great good thing was finally apprehended and this reader acknowledges with great respect the cost of the journey and rejoices in the sweetness of the attaining. If you read one spiritual memoir this year, The Great Good Thing should probably be it. I listened to the audio version of the book while I worked in the kitchen and kept looking for extra tasks—wiping out drawers, organizing spices—just to find an excuse to keep listening.Klavan recounts the events from his early childhood to his baptism as a series of five epiphanies that led him, by small but essential steps, to finally embrace the truth he could no longer deny. It's not an apologetic work, per se, but he can't help but explain the reasons that the other spiritual (and anti-spiritual) beliefs he tried could not satisfy his need for truth. And he knew that truth—whatever that turned out to be—must be both internally consistent and reflective of the world he saw around him. In that sense, it's a reasonably good argument for Christ. But it's much more than that. It's Klavans gift with story, his sense of timing, his breadth of knowledge, his elegant turns of phrase, that make this a delight to read. And, I confess, I had to wipe away tears of joy as I dumped flour into my whirring KitchenAid while listening to him read, at last, the words of the baptismal rite. I'd recently been meditating on the first question to the Heidelberg Catechism, which is just packed with wonderful truths: "Q. What is your only comfortin life and death?A. That I am not my own, but belong with body and soul,both in life and in death, to my faithful Saviour Jesus Christ. He has fully paid for all my sins with his precious blood, and has set me free from all the power of the devil. He also preserves me in such a way that without the will of my heavenly Father not a hair can fall from my head; indeed, all things must work together for my salvation. Therefore, by his Holy Spirit he also assures me of eternal life and makes me heartily willing and ready from now on to live for him." Every one of these truths is evident in this book, but namely this: "All things must work together for my salvation." Klavan is able to look back at the beauty and the sorrows, the glory and the grief, of his life and see how all of it, even the things that one would never expect could lead a man to Christ, was the hand of God working all things together for his salvation. And that certainly is a great good thing. Excellent. This is the story of someone who stood in the wreck of Western civilization and saw only despair for a time, and how joy finally overtook him. I work in academia, and I know the feel of that wreck up close, and he describes it well. In a post-Christian world, conversions like his are only going to become more common. Evangelising (by personal communication or preaching) had no part in his conversion. In America (and Australia, for that matter), the evangelical culture insists on evangelizing at the drop of the hat (only they don't wait for the hat to touch the ground), so this is something evangelicals should pay attention to. Since evangelicals generally talk more than they listen, it's worth repeating: evangelists and ministry outreach had no direct role in his conversion. God, apparently, has the world at his disposal.Another aspect of Klavan's conversion is that it took decades. He did not come to God in an instant, but in a series of insights over the span of many years. God was not the flick of a switch, but a gradual brightening, until the moment he looked up and saw the sun had risen.Perhaps I liked this book so much because many of Klavan's questions and some of his experiences were similar to mine. He was a messed-up person, but through love and friendship had many of his problems fixed.After having heard of this book, I started listening to The Klavan Show, which is incredibly funny, as well as insightful, political/cultural commentary. Also, Andrew is a really cheerful guy, which sets him apart from nearly every other conservative commentator, who are serious, gloomy and pessimistic.I recommend both this book and the podcast very highly. Having read a fair number of conversion stories I find similar themes along with the unique story of the individual. Especially true here as Mr. Klavan writes of his childhood on through his difficult professional years and beyond. I especially appreciated how he could speak of some of those difficulties involving his parents without any bitterness with an attempt to better understand them. Especially considering his fathers almost daily attempts to prevent him from becoming a writer. One of those aspects that would be doubtful in fiction, but ring of a real life story.His detailed treatment of his nihilistic tendencies seeking the goods of life without finding the complete joy of life are well detailed. You really feel as far as anyone is able what this was like. Add to this Klavan's writing skills and this is a phenomenal spiritual biography.This book is for a general audience and is not a work of Christian apologetics. No attempt is made to explain what Christian church he attended other than a previous connection with the pastor. This book also avoids politics and keeps the story to his personal story. This considerations are very apt to make this book so readable and insightful. Klavan is a blessing, and his videos are some of the funniest, smartest, most pointed commentary on the internet. But only a novelist would decide to give his testimony in the form of an autobiography that starts basically at the moment of birth, and cover every stretch of his life in intimate detail.We can be glad that his wife told him to trim the book down to what it has become. The first chapter is in fact the best; everything was anti-climatic after that. I'm not sure I wanted to get so far into Mr. Klavan's head as I was led by the text, but as a guy that toys with becoming a writer at times, it was interesting perspective.The book itself might not be a great good thing, but it's a good thing. 3 1/2 stars. This could have been just chapter one about his childhood and chapter thirteen about his conversion. It reads like a really long blog entry...he's in his head so much. It's obviously a great conversion story. I just wish it had been written differently, less rambling, more plot. The Great Good Thing was a book I have had my eyes on for a while. I am a huge fan of Andrew Klavan's works, and in my mind, he is probably one of the best authors out there. Nothing quite matches his thrillers intensity or his writing skill. Not only that, I'm a huge fan of Andrew Klavan's work in the political field--his coverage of the news events.So, when he announced he was going to be publish a novel about his past and how he came to Christ, I was very excited. And when I saw the opportunity to become part of the launch team, I jumped at that opportunity too. Because being part of the launch team meant I would get the book early.Well, I have read the book now. Finished it a while ago, and after thinking about it, I've decided that it disappointed me in no way. It was everything I could have hoped for. Okay, I do wish there was more about Klavan's past, just because he wrote it so well, and I'm a sucker for autobiographies. But Klavan handles his description of Christianity and his conversion like none I have read.Not even the most hardened atheist or skeptic would not be rolling their eyes at how Klavan tells the story and weaves his conversion with how much of a skeptic he was. It is incredible to see his journey from skepticism to faith, from moral relativism to Christianity. If your a Christian, this book is sure to teach you something. If your an atheist or an agnostic, I certainly recommend reading this. Not because I think it will convert you, but because it is a GOOD book. At the least, you will walk away with an appreciation, and maybe Klavan will make you think twice with his eloquence.There are a few points, I wish Klavan had made clearer, however. At the end he left me guessing as to whether he believed in the inerrancy of scripture, which is a foundational principle. But at the end, I was left fairly certain, that Klavan was indeed a Christian, and that his testimony was one that everyone should read.And I highly suggest that you read this book. Before I read this book, I had never heard of Andrew Klavan who is a well-known, award-winning novelist, nor had I read any of his previous work. What attracted me to this book was the subtitle: A Secular Jew Comes to Faith in Christ.The Great Good Thing is Andrew Klavan's story. He is that secular Jew and this is his memoir. This is the account of how, in his words, "by the hilarious mercy of God, I had made my way to the great good thing. "In the first chapter, Klavan is heading to the church to be baptized; in the last chapter the baptism takes place. In the thirteen chapters between, Klavan shares some of the events of his life that played a part in leading him to the great good thing.This is not a typical conversion tale, if indeed there is such a thing. It is not a book about doctrine or theology. It is an interesting, well-written account of an agnostic Jew who ends up at a baptismal font at the age of 50. Klavan is very open about how he fought the call of God, a call first glimpsed in a childhood Christmas at the home of a beloved babysitter.The Great Good Thing: A Secular Jew Comes to Faith in Christ is Andrew Klavan's life story. It is wonderfully written, just as might be expected from an award winning writer. It is interesting account of an interesting man's journey to Christ. 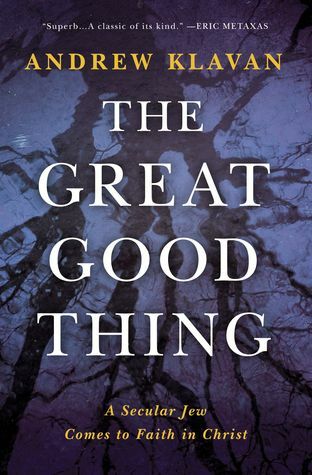 A highly recommended read.I received a free copy of The Great Good Thing by Andrew Klavan from Blogging for Books in exchange for my honest opinion. A great account of a conversion to Christianity, the equal in fascination to Surprised by Joy: The Shape of My Early Life and very much like it because Klavan's decision process is heavily informed by literature. Having become familiar with Klavan via his satirical work, I was pleased to find out how deep (if idiosyncratic) his philosophizing goes. He also handles with sensitivity his rocky relationships with close family members. Highly recommended. Insightful and engaging. His intellectual evolution, which seems to have been one of God's major means toward his conversion, was a great read. Lots of insights into the Christ story at the center of the West. It was profound to hear a Jewish Christian observe the beauty created by the West and yet the horror it perpetrated against Jews. A masterpiece. I need to listen to this audiobook again. It is warm, funny, deeply philosophical, very human, and humbling. It is also both tragic and joyful in a non-paradoxical way that Klavan wonderfully describes in his direct but elegant prose. This autobiography is the story of an ordinary everyman coming to grips with his soul, his place in the cosmos, and the purpose of his life. The journey and discovery never fail to fascinate. This book is so heartfelt and unpretentious that I believe that anyone, believers and non-believers alike, would enjoy it and share in its author’s thankfulness in discovering the great good thing. This was really good. Klavan traces the roots of his conversion through moments, events, and crises, with a keen eye for how God was preparing him for the gospel from his earliest days. Although his father was a negative influence in many ways, Klavan seeks to honor him throughout, while managing not to step in some of the piles that Freud dropped. He has a great deal of personal and ethnic baggage to get through, but as he works it out on the page, Christ is compellingly presented as the one in whom all things hold together. Given this account, it is a remarkable testimony to the power of God that Klavan didn't convert to the gospel of therapy, but looked deeper until he found Christ. Klavan's coming to faith in Christ is a fascinating, sometimes heartbreaking journey, told in compelling and honest detail. His slow transformation from an atheist skeptic to an unlikely believer mirrors my own in many ways, and know well Klavan's own sense of bewildered gratitude. Now to try some of his fictional writing...I've grown to really admire this man and want to experience his craft. I listened to this audio book read by Andrew Klavan. What a treat! Klavan opened up his heart and mind revealing his journey with humor and vulnerability, resulting in him entering into this final stage of being "fully alive". I hope he writes a sequel, showing his continued walk in this new dimension. I'm not sure what my expectations were for this, but I think it's safe to say it exceeded them. Parts actually moved me to tears. As a lifelong Christian, I love and value conversion narratives. They inspire me to hopefulness and bolster my own faith. This book did both. I really enjoyed this book. I great testimony of God's persistence, patience, love, and grace! I enjoyed the author's style of writing and appreciated that he narrated the audio version. I love hearing how God saves people. Klavan’s writing is excellent and I even found him expressing things that overlap with my story that I have been unable to put into words. Good stories take you away from reality, great stories reveal unseen realities in you. Klavan’s book did that for me. Wonderful. Audiobook read by the author. At first, I found the prose a bit purple. Could you cram in any more adjectives?, I thought to myself. But once I got past the first chapter, the book began capturing my imagination. Klavan has written a startlingly honest, whimsical account of his life journey that is quite engaging. I consider myself somewhat introspective and analytical, but I must say he has me beat by a mile. I can't imagine being as introspective as that. What a unique man with a unique perspective and testimony. Klavan's was not a Damascus Road conversion, but slow and subtle. I'm glad he made it and took the time to share his engaging story. A Hard-Boiled Thriller Writer Finds GodAndrew Klavan is best know for his hard-boiled, gripping crime fiction and the movies made from it like True Crime and Don’t Say a Word. However, there is another aspect to Klavan. Born a Jew in the wealthy suburb of Great Neck, he was a constant seeker of truth. As a child, he retreated into his stories to the exclusion of the real world, at least partly due to the fraught relationship with his father. Klavan first became interested in Christianity when he realized that the stories he loved including the crime fiction of Chandler had a basis in Christianity. It didn’t lead him to a conversion immediately, but the search for truth was there even in his most desperate, suicidal moments. I enjoyed this book. Klavan is an excellent writer. He brings you into his world and takes you through all the difficult times and good times that led him to finally accept Christ and be baptized. If you’re a writer, or an aspiring writer, the description of his search to learn his craft is enlightening. He hated school and believed that experience was the road to becoming a writer. Eventually, he did go back to school and earn a degree at Berkley. It was there that he started reading great literature and his search for truth really began.I recommend this book. Although his search led him from agnostic Judaism to Christianity, the story is really about the search for truth. It’s beautifully written, and the story of his life gives insight into not only becoming a Christian, but becoming a writer. I received this book from BookLook Bloggers for this review. I really enjoyed this book. It starts by really drawing the reader into the mind of the author as a child, and it's a captivating description of his thoughts, motivations, fears, and desires. Gradually you see Klavan set things aside that he deeply still desires, things that he only finds as an adult in his experience of God as a Christian. It's a beautiful picture of how we were made to find fulfillment ultimately only in a relationship with God.Though this is a conversion story, it is not a sappy story, nor one of dramatic and rapid repentance and transformation. Instead it is the unfolding of the touch of God's grace on each aspect of Klavan's life. It is a comprehensive and sustained salvation of a soul that touches on theology, psychology, and experience, and this was a soul that was convinced there was no God. I appreciated his honesty with himself and with the reader. As a novelist he is able to tell his own story well, building suspense and bringing surprises. I found it helping me reflect on what's really important in life and the need to allow God to reach me in those places.The only drawback I saw were a couple of places where his descriptions turned a little corny. And there were times that the chapters seemed poorly connected. Things would be presented as if the reader didn't know about them, though the situation had been dealt with in a previous chapter, which gave me an odd feeling of having been introduced to people or situations twice, as if the author had forgotten he had shared that with me already.Thanks to my twin for sending me this gift as an early Christmas gift! A very interesting story of a thinking man's conversion. Reminds me in some ways of CS Lewis's conversion because it was such a logical progression based on Klavan's personal experiences. What I found especially profound is how much the author was drawn to Christ because of Christianity's effect on Western culture. Because of Jesus, the ends of beauty, truth and justice are both worthy and achievable. There are a few passages throughout this book that are some of the most beautiful and profound that I have ever read. He tells a story from his childhood about how we sought to achieve a Zen-like state of awareness, only to discover how meaningless it turned out to be. Without our minds to shape and interpret our outward experiences, the world is rather drab and uninteresting. A Secular Jew Comes to Faith in ChristBy Andrew Klavan" Superb...A classic of its kind. " - Eric MetaxasThis books is very inspiring me to getting to know more as before about the faith in christ inside this book had give me and challenge me to going to deep in the store with the Author and he also writing down in this book very beautifully and easy to follow for the all story and exciting to read more and more with The Great Good Thing, Klavan had telling us about his trouble childhood cause him to live inside the stories in his head and grow up to become an alienated young writer whose disconnection and rage devolved into depression and suicidal breakdown. But he also stumbled into a genuine romance, a passionate and committed marriage whose uncommon and enduring devotion convinced him of the reality of love. This book is also a great story of the dramatic, soul-searching story of man born into an age of a disbelief who had to abandon everything he through he knew in order to find his way to the truth. Andrew Klavan his is also the Author of internationally bestselling crime novels such as True Crime, filled by Clint Eastwood. I highly removed this book for everyone must read." I received this book free from the publisher through The BookLook Bloggers for this review "